Danuta Pavilenene, BC, Vilnius, 13.07.2009. 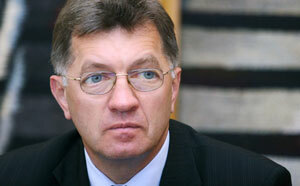 Algirdas Butkevicius, chairman of the Social Democratic parliamentary group, thinks that Lithuania is most likely to be able to adopt the euro in 2013-2014. "If in 2011, the economic crisis is over and as it is foreseen in promises, real salary is restored to the level of 2008, then we will see what processes will take place in our economy. The most likely case could be the years of 2013-2014 when the real salary of former level is restored," Butkevicius forecasted at a news conference on Monday. When asked why in his opinion, the euro will not be adopted in 2012, the politician said that first of all because in 2011 we will have to increase the salary payment fund, informs ELTA/LETA. "The salary reduction for state servants and employees in the budget sector is foreseen until 2011. When the salary payment fund increases, turnover on the market will increase. This means that the prices of goods and services will increase and automatically inflation will start growing," Butkevicius said. He underlined that the European Commission would analyze whether there will be no certain threats, especially in those countries where salaries were reduced artificially or other measures that purportedly are not applied in free market economy were applied. "And this is currently being done in Lithuania," Butkevicius said.